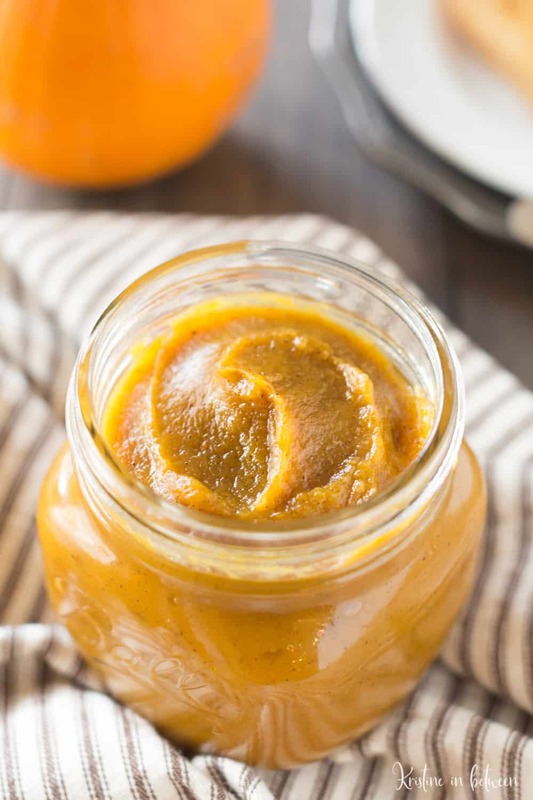 This thick and hearty fresh pumpkin butter is loaded with fall flavors and is the perfect topping for toast, ice-cream, or even stirred into oatmeal! Hey there! It’s Kristine from Kristine in between again, stopping by with another wonderful fall recipe for you. I personally start my pumpkin season early, like let’s say late August and I keep it going clear through Thanksgiving! There are just too many incredible pumpkin things that I need to make (and eat)! 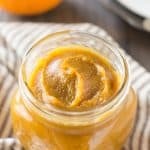 When it comes to the regular pumpkin recipes though, there are a few that never ever get skipped over here; pumpkin waffles, pumpkin chili, pumpkin snickerdoodles, and this fresh pumpkin butter made with homemade pumpkin puree. I make these recipes every single year (and sometimes, multiple times!). If you’ve never tried pumpkin butter, it’s a little bit like apple butter, but more pumpkin-y (yes, pumpkin-y is a totally a thing!). Anyway, it’s basically just pureed pumpkin cooked together with some brown sugar and spices to make it into a thick and spreadable ‘butter’. Then you just slather it all over anything you want. Some of our favorites are warm toast or scones, over vanilla bean ice-cream, and my personal favorite is to stir some into my morning oatmeal! Mmm! 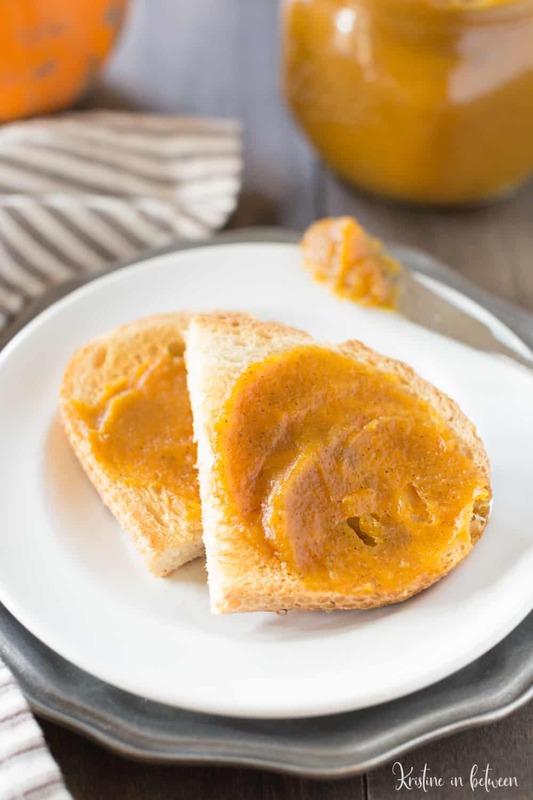 The process for making this fresh pumpkin butter is super simple. All you need is one pie pumpkin and some traditional baking spices, which I bet you already have on-hand. To make the pumpkin puree, start by washing the pumpkin really well. You want to get all the dirt off. Then cut the stem off, halve it, scoop out the insides (it doesn’t have to be perfectly clean), chunk it up and pop it in the Crock-Pot, skin side up. Cook the pumpkin for 2-ish hours (until fork tender), remove it from the Crock-Pot and let it cool. After you scrape the flesh from the skin and process it in the food processor for a few minutes (or mash it with a fork), you’ll have perfectly smooth homemade 100% pumpkin puree. 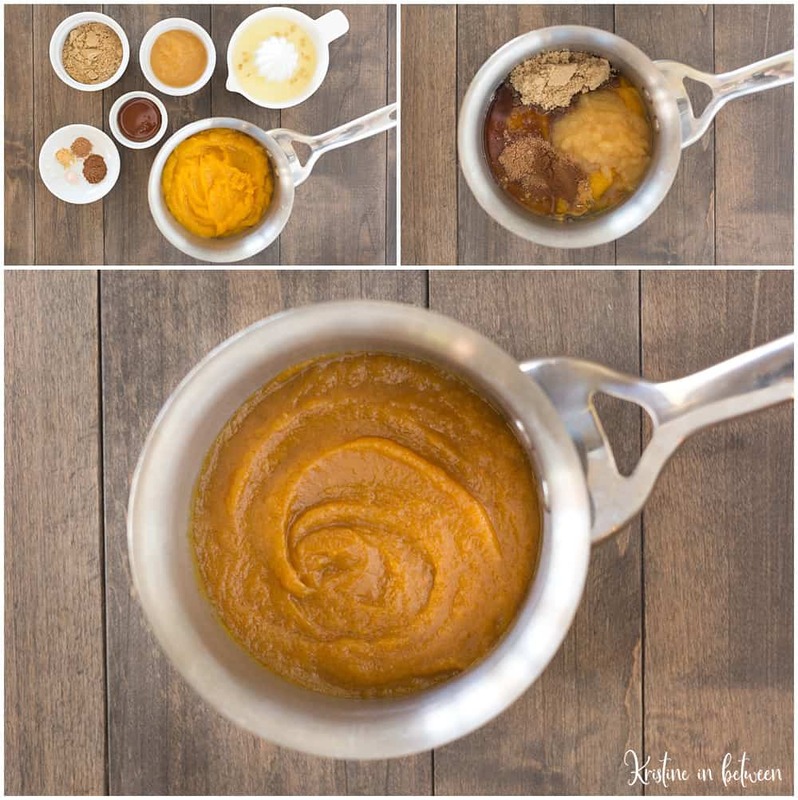 To make the fresh pumpkin butter, you combine the pumpkin puree, sweeteners, applesauce, and spices in a sauce pan on the stove and cook it down for about 20 minutes. Let it cool a little, spoon it into a mason jar, and enjoy! A thick and hearty pumpkin butter made from one pie pumpkin. Perfect for toast, over ice-cream, or stirred into oatmeal for a taste of fall. Slice the top of the pumpkin off and cut in half. Remove the seeds and strings from the inside of the pumpkin (saving the seeds if you want to roast them later). 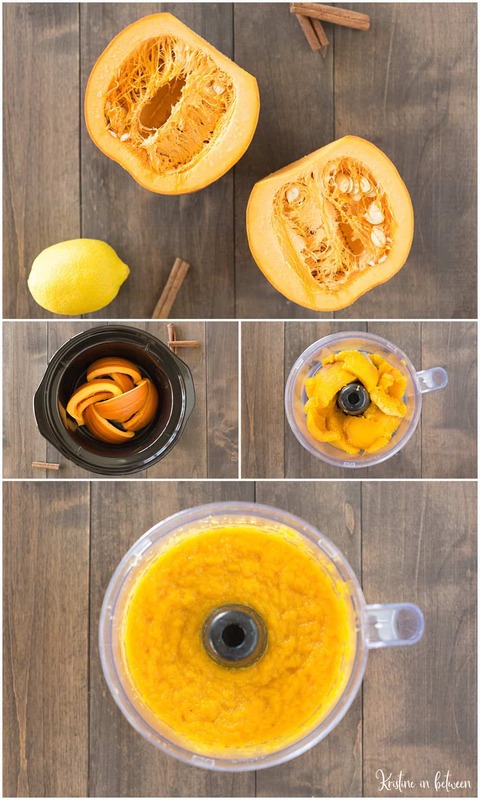 Chop pumpkin into large chunks and place in Crock-Pot skin side up. Cook on high for 2-3 hours until pumpkins are soft and a fork easily pierces this skin. Remove from Crock-Pot and allow to cool. Once cool enough to handle, scrape the flesh from the pumpkin skin and place in the food processor. Process on high for 2-3 minutes until completely smooth. Place 2-1/2 cups pumpkin puree in a medium saucepan. Add brown sugar, applesauce, maple syrup, spices, and vanilla extract. Over medium heat, whisk all the ingredients until smooth. When the mixture reaches a 'boil', cover and reduce heat, cooking for 20 more minutes, whisking occasionally. After cooking, remove lid and stir in lemon juice. Place in a mason jar and allow to cool. Store in the fridge for up to 2 weeks or freeze for up to 6 months. *To make recipe in less time, substitute canned pumpkin. Hi there! I’m Kristine the cookie lover, avid baker, and photo taker behind the food and lifestyle blog, Kristine in between. I believe life is short – enjoy the in between moments and eat more dessert! Stop by and say hi sometime!